Weight: 3.91 oz. 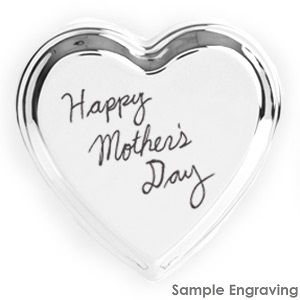 / 111 g.
Make this is a special gift for mom by having a handwritten message engraved on top! Nickle plating prevents tarnishing. The inside has a velvety blue lining. Box measures 1 3/8 inch high with cover, and 1 inch without. It is 3 inches both across the widest part and from top to bottom. The interior is approximately 1/5 inch smaller around than the exterior.